Four priorities contain many cross-cutting issues that require close cooperation among APEC members, according to APEC 2017 SOM Chair. 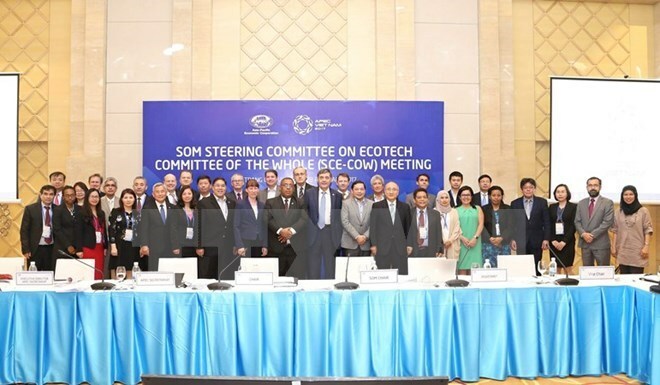 In his opening remarks at the meeting of the SOM Steering Committee on Economic and Technical Cooperation (SCE) - Committee of the Whole (COW), convened in the coastal city of Nha Trang on February 28 as part of the first APEC Senior Officials Meeting (SOM1), Deputy Foreign Minister and APEC 2017 SOM Chair Bui Thanh Son announced that Vietnam has proposed four priorities for APEC Year 2017, the Vietnam News Agency reports. The first priority is to promote sustainable, innovative and inclusive growth. Structural reform and innovation play a significant role in bolstering growth and improving productivity. Human resources development, education, lifelong learning and re-skilling in particular will be crucial to ensure all segments of society in APEC member economies will actively participate in the workforce and benefit from the technological revolution. The second priority is for regional economic integration and connectivity. It is important for APEC to accelerate the realization of the Bogor Goals on free and open trade and investment in Asia-Pacific with a new sense of urgency. APEC needs to fulfill the unfinished businesses to achieve the Bogor Goals. At the same time, it needs to envision its future and role in the region and the world. Mr. Son stressed that APEC members need to reaffirm support for the multilateral trading system and implement the Lima Declaration on the Free Trade Area of the Asia-Pacific (FTAAP). It is also important to continue implementation of the APEC Connectivity Blueprint, enhance global value chains and support industries, and facilitate cross-border e-commerce, investment and services. The third priority is to help create dynamism for micro-, small- and medium-sized enterprises (MSMEs) - a key driver of the region’s growth and which account for about 97 per cent of the total number of APEC businesses. APEC members should seek ways to make value chains more inclusive, with greater participation by MSMEs, focus on creating a more enabling business environment for MSMEs in the digital age, and promote startups and innovative MSMEs. Improving food security and achieving sustainable agriculture is the fourth priority for APEC 2017. This is the second goal of the Sustainable Development Goals (SDGs). The transfer and application of technology will be crucial to improving agricultural productivity and climate change resilience. APEC members will need to cooperate to sustainably manage resources, including water, while pursuing existing efforts relating to the food market and the sustainable and inclusive development of rural areas. Mr. Son said that these priorities are aligned with the medium-term priorities the SCE has established for the 2015-2019 period. He said the SCE plays a very important role in overseeing the efficient functioning of all its working groups and forums, enhancing cross-forum collaboration to better address cross-cutting issues, as well as steering APEC’s work on Ecotech. The four priorities of APEC 2017 contain many cross-cutting issues and require close cooperation between relevant APEC committees, working groups and forums. It therefore counts on the support and contribution of the SCE to the overall work of APEC this year, the Deputy Foreign Minister concluded.